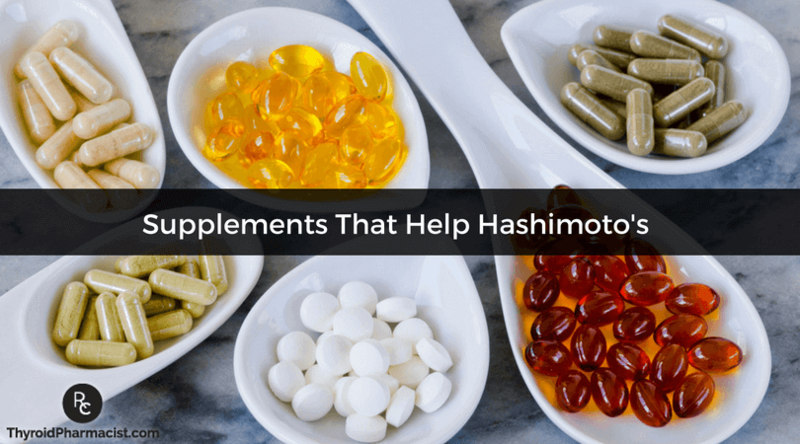 Over the years, I have researched, evaluated, purchased and tried a variety of medications, supplements and lifestyle changes to determine which would be most helpful in overcoming Hashimoto’s. Evaluating the safety, efficacy and cost of various treatments was a large part of my training as a pharmacist, and I have put my training to good use in overcoming Hashimoto’s! I have found that a combination of the right medications (when indicated), right lifestyle changes, and right supplements can make a tremendous impact on recovering from Hashimoto’s. I like to use technology to my advantage and have found that certain supplements are a great way to speed up the healing process. I have spent hours upon hours researching supplements. I have purchased and tried truckloads of supplements and often receive samples from various companies. I have found that some supplements make zero difference—despite their high cost. Snake oil anyone? Some supplements can be harmful if taken without proper lab testing and medical supervision. For example, spirulina and echinacea can cause new onset autoimmune conditions; high dose iodine can increase the autoimmune attack on the thyroid; and adrenal hormones can cause breakouts, swelling, palpitations, joint pain, and brain fog (personal experience, ouch!). I have also found supplements that are safe and effective for most people. I covered many of these helpful supplements in my first book, Hashimoto’s The Root Cause, but have also found quite a few additional supplements since the book was published. If you are struggling with thyroid symptoms and looking for some support, there are six supplements that can help. Naltrexone is actually a medication, rather than a supplement, but due to its low propensity to cause side effects, many say that it actually acts as a supplement. The primary use of Naltrexone is to counter drug addiction, but it also has an off-label use as an immune modulator. When used in low doses, Naltrexone has been found to reduce the autoimmune attack on the thyroid. Low Dose Naltrexone (LDN) helps reduce antibodies and stabilize immunity. It balances the immune system by increasing the amount of T-regulatory cytokines and modulating TGF-B. This leads to a reduction of Th17, which is a major promoter of autoimmunity. Many people have been able to eliminate their symptoms and reduce the dosage of their medications with LDN. I’ve also seen women with thyroid antibodies in the 1000s range that have been able to reduce them down to about 100. Some people have even been able to get off their medications completely! In the beginning of my journey, I used LDN for a few days but gave up on it after experiencing symptoms of irritability. I now know that LDN works best in combination with a leaky gut diet and in titrated doses so that it is better tolerated. LDN is only available through compounding pharmacies and is not commonly prescribed, so it can be difficult to get access to this medication. I recommend reaching out to your local compounding pharmacist to find out which doctors in your area are knowledgeable about prescribing LDN. Read more about LDN. Intestinal permeability (leaky gut) is one of the three legs of autoimmunity. We know that eating gluten can cause a leaky gut, and many people have been able to reduce their symptoms and antibodies by following a gluten free diet. However, there are various other root causes of intestinal permeability, including an imbalance of good and bad bacteria in the gut. We often use antibiotics to fight off bad bacteria and heal infections but, unfortunately, antibiotics also eliminate the good bacteria we need in our gut to help our digestion processes. If there aren’t enough good bacteria to keep the bad under control, they start damaging the gut walls causing leaky gut. Supplementing with probiotics is a natural way to put the good bacteria back in and help restore balance. Probiotics are known to help with anxiety, gut symptoms, extracting nutrients from our food, and balancing the immune system. They can also help with treating Small Intestinal Bacterial Overgrowth (SIBO), which is present in over 50% of Hashimoto’s patients and causes leaky gut. When supplementing with probiotics, you want to make sure you’re getting enough. I recommend starting off with a low dose and building your way up. Many probiotics sold in stores have around 10 billion colony-forming units, but your gut has a hundred trillion unit colonies of bacteria. So, most commercial probiotics and yogurts don’t have enough to really make a difference. My favorite probiotics include VSL#3, Pure Encapsulations Probiotic 50B, Klaire Labs Ther-biotic, and the yeast-based probiotic, Saccharomyces boulardii. In addition to supplementing with probiotics, I also enjoy eating fermented coconut yogurt, fermented coconut water, and fermented cabbage. Read more about probiotics. Selenium is a natural antioxidant that provides support for the immune system and promotes healthy blood flow. It works in synergy with vitamin E to assist in healthy growth and fertility, protect normal cell function, and enhance the function of certain energy producing cells. (1) Selenium deficiency has been recognized as a trigger for developing Hashimoto’s. It is thought that when there is a depletion of selenium in the body, we are not able to neutralize hydrogen peroxide which is produced as a byproduct of thyroid hormone conversion. So, it begins damaging the surrounding tissue and may cause an influx of immune cells that tend to get confused and start attacking the immune system. The selenium forms selenoproteins to protect against hydrogen peroxide damage and acts as a catalyst for converting inactive T4 into biologically active T3. Selenium has been found to reduce thyroid antibodies and makes people with Hashimoto’s-induced anxiety feel calmer. People have also been able to improve their thyroid conversion by taking selenium. When the body is functioning at the optimal level, you feel good, and you’re able to process foods and detoxify naturally. This helps process stress, and life in general, and can lift your overall feelings of anxiety considerably. Thyroid antibodies have been shown to be reduced by 50% in three to six months with dosages of about 200 micrograms of selenium. However, I recommend consulting with your practitioner to determine what dosage is best for you. Read more about selenium. Betaine with Pepsin is a natural, gastric acid that helps with the absorption of calcium, B12, protein, and iron. It helps break down food for the body to absorb. This is especially significant in Hashimoto’s patients because many of us have a deficiency in stomach acid. The breakdown and digestion of protein requires stomach acid. If you’re not digesting your food properly, you’ll have more food sensitivities and symptoms of acid reflux. It makes you tired because your body is using more resources to try to digest food, and it can also lead to liver backlog because you won’t be excreting toxins correctly. Based on my survey of 2232 people with Hashimoto’s, 50-70% of people with Hashimoto’s are likely deficient in stomach acid. Symptoms that improved for participants included higher energy levels, reduced pain, and improved moods. One-fourth of respondents even reported weight loss. Betaine with Pepsin helped me to digest proteins and finally get my energy back after almost 10 years of fatigue! Betaine with Pepsin dosage needs to be individualized. The best way to find your target dose for Betaine is to start off with one capsule with a protein-containing meal. If you don’t feel anything, increase the dosage by one capsule with the next protein-containing meal. This rate of increase is continued until a slight burning sensation in your esophagus is felt. Then you know that you have too much stomach acid and need to decrease the dosage by one capsule. Read more about Betaine with Pepsin. Systemic enzymes help to normalize TSH and reduce or eliminate antibodies. They work by helping to break down circulating immune complexes, which can trigger autoimmune disease. Basically, an immune complex is where an antibody and antigen combine forces to damage our immunity. Breaking these immune complexes apart is very important in getting into remission because when they can’t attack the immune system, our bodies are given a chance to heal. One study found that when people took five capsules of systemic enzymes three times a day, they were able to improve the appearance of their thyroid on an ultrasound, normalize their TSH, and lower their thyroid antibodies. Participants in this study also reported improved symptoms. In another study, 40 people with Hashimoto’s who were on levothyroxine were given systemic enzymes for 3-6 months. Participants saw a reduction of thyroid symptoms and antibodies, as well as a normalization of their thyroid ultrasound. Many patients were able to reduce their dose of levothyroxine or even discontinue their medications! Systemic enzymes are best taken on an empty stomach, at least 45 minutes before a meal or 1 ½ hours after a meal. If you take them with food, they will be used for the digestion process instead of getting into the bloodstream to work against the immune complexes. I’ve seen great results with Wobenzym PS by Douglas Laboratories and the Systemic Enzyme Complex by Pure Encapsulations. Read more about systemic enzymes. Our adrenals are critical to maintaining overall health. When the adrenals are out of balance, the rest of the body quickly follows suit. This is especially significant for Hashimoto’s patients because stress is often a major contributing factor, and the adrenals and immune system work so closely together. Moducare helps to promote a normal balance of the adrenal hormones, cortisol, and DHEA, and works as a safeguard against negative stress reactions. (2) It contains natural plant sterols and sterolins that balance Th1 and Th2 helper cells, which strengthens cellular immunity and overactive immune responses. People have been able to improve their adrenal function, as well as reduce antibodies to the thyroid and in other autoimmune conditions, with Moducare. While these sterols can be found naturally in fruits and veggies, I’ve found that using supplements like Thorne Moducare works best because we don’t always know how much is in our foods. It may be helpful to try different amounts and work with your doctor to see what works best for you. Hope this information helps you on your journey! P.S. Be sure to sign up to my weekly newsletter to get a free book chapter, recipes, my Thyroid Diet Quick Start Guide, notifications about upcoming events, and my latest research. Seo Y, Sweeney C, Smith M. Selenomethionine induction of DNA repair response in human fibroblasts. Oncogene. 2002;21(23):3663-3669. doi:10.1038/sj.onc.1205468. Pegel K. MODUCARE® – A Brief History And Mode Of Action. ; 2002. Available at: http://www.moducare.com/wp-content/uploads/2016/05/moducare-summary-of-research.pdf. Accessed September 5, 2017. Thank you so much for all the information , it is good to know that a lot of other people feel the same as I do. This has been going on for a long time for me and now I want my life back. P Pandolfino- Thyroid tissue can regenerate, but the rate at which it does is not always predictable. Thus, some are able to stop the autoimmune attack on their thyroid and regain normal thyroid function. Others can reduce the dose of medications, and others will need to stay on the medications indefinitely. I’m currently working on some protocols to help with tissue regeneration. thank you so much for all your doing! i had cushing..a tumor in my Hypophysis .it was removed at december 2015,,since than i am taking hydrocortison i have had hell ! i am taking a lot of herbs and supplements that helps but lately they say i have also hashimoto..i am not taking altroxin i will do everything but not that..
i am buying now your books and checked the supplements,but i saw that some people say about moducar it reduced their cortisol levels..
so,i guess the other supplements will be fine but not that one..? Betty- There are quite a few options for thyroid medications. In my experience, what works for one person may not work for another. If your doctor will not prescribe the medication you are looking for, ask your local pharmacist for doctors in your area who prescribe the medication you are looking to try. Have you read these articles? Susan- Not everyone will need every single supplement! In fact, I believe that most nutrients should come from the diet, this is why I always list food sources for most of the nutrients, vitamins, minerals and probiotics that are depleted in Hashimoto’s in the book and on the blog. However, some may require/prefer supplements and the supplements on the website are a resource for those that do. I recommend getting tested for deficiencies to determine your need for a supplement as instructed in the book and blog. I also don’t recommend starting multiple supplements all at once. I recommend starting one at a time and then adding another a week or so later once it has been confirmed that the first supplement is not causing any harm. I am reading Hashimoto’s Protocol, and so appreciate all the knowledge and advice you share there and on your website! My question is: If I follow the protocol supplements suggested, there’s a lot of overlap/redundancy. For example, I am taking the Rootcology NAC supplement, but there is also NAC in the “Liver Reset” powder, and the “Methylation Support” pills. I have the same concern with the amount of B vitamin overlap in the Adrenal Recovery Protocol. Do I need to be concerned about and keep track of these cumulative amounts? My tendency is to follow instructions very closely and do everything indicated, but I’m worried about over-supplementation. I am also working with a functional medicine clinician. Thank you for any clarity you can provide! How are we supposed to start out low dose of 10B on a recommended probiotic like Pure Encapsulations Probiotic 50B? Tiffany – thank you for following this page. Maggie- Not everyone will need every single supplement! In fact, I believe that most nutrients should come from the diet, this is why I always list food sources for most of the nutrients, vitamins, minerals and probiotics that are depleted in Hashimoto’s in the book and on the blog. However, some may require/prefer supplements and the supplements on the website are a resource for those that do. I recommend getting tested for deficiencies to determine your need for a supplement as instructed in the book and blog. I also don’t recommend starting multiple supplements all at once. I recommend starting one at a time and then adding another a week or so later once it has been confirmed that the first supplement is not causing any harm. Do you have a recommendation on which order to start supplementation? If you are starting 1 per week, what order would be optimized for effectiveness, etc? Do any of your articles talk about this? Thank you! HI I listened to your inerview with SEan, and oh my goodness it’s so nice to know I’m not the only one with these issues. Thank you for such a great lesson on suppliments. I do have one question for you: The one digestive enzemye you talked about that changed everything for you what is that called. Not the betaine with pepesin but the other one. The one that Sean started to take as well for his knee and it felf better. I’m so lost with digestion. Thank you again. Amy- Not everyone will need every single supplement! In fact, I believe that most nutrients should come from the diet, this is why I always list food sources for most of the nutrients, vitamins, minerals and probiotics that are depleted in Hashimoto’s in the book and on the blog. However, some may require/prefer supplements and the supplements on the website are a resource for those that do. I recommend getting tested for deficiencies to determine your need for a supplement as instructed in the book and blog. I also don’t recommend starting multiple supplements all at once. I recommend starting one at a time and then adding another a week or so later once it has been confirmed that the first supplement is not causing any harm. Hi Isabella, If I can only order one supplement at this stage what would you suggest? My gut appears to be going well, but neck tension and anxiety are my key concerns. My antibodies halved after adding selenium and Vit E and I am on 2 grains of NDT. My levels are still very unstable and am needing to increase my medication every month. When they are in range I feel fantastic. I also follow the AIP diet. Would really appreciate any guidance so I can finally feel better and stay that way. Jess- Not everyone will need every single supplement! In fact, I believe that most nutrients should come from the diet, this is why I always list food sources for most of the nutrients, vitamins, minerals and probiotics that are depleted in Hashimoto’s in the book and on the blog. However, some may require/prefer supplements and the supplements on the website are a resource for those that do. I recommend getting tested for deficiencies to determine your need for a supplement as instructed in the book and blog. I also don’t recommend starting multiple supplements all at once. I recommend starting one at a time and then adding another a week or so later once it has been confirmed that the first supplement is not causing any harm. EVERY TIME I FIND SONETHING BENEFICIAL FOR THYROID DISEASE, IT COST MONEY. YOUR MAY SEMINAR IS CASE IN POINT: JUST BUY THE VIDEOS. …BODY ECOLOGY IS the SAME WAY. Looking at the book on Amazon gave very little information on the “inside”…at least I knew who you thanked….just my opinion. You said to take selenium with vitamin E on an empty stomach. My question is how far do you wait to take other supplements ? And when is the best time to take the selenium? Selenium and Vit E. When do you take these supplements and how long to wait in-between taking other supplements? Isabella, I have your book and I listened to most of the seminar. That was the reason I got your book as I gleaned the most useful info. from your comments. I love that you keep us posted and seem to be concerned about helping us. It’s 3 years since I was diagnosed with hasimotos & myasthenia gravis, lately I have developed psorasis, arthritis, and indigestion, so I’m really needing to change something. I have not been taking thyroid hormone but taking 12.5 mg iodine, hoping to avoid the hormone. (It’s not working!) So I’m ready to take the hormone. I’ve gone gluten free and healthy diet. I am anxious to learn of your addvise on the supplements. Thanks, Isabella. What is the difference between Selenium and Hypo-Selenium? My daughter is 11 and was just diagnosed with Hashimotos and anxiety is a huge symptom. Toni- Not everyone will need every single supplement! In fact, I believe that most nutrients should come from the diet, this is why I always list food sources for most of the nutrients, vitamins, minerals and probiotics that are depleted in Hashimoto’s in the book and on the blog. However, some may require/prefer supplements and the supplements on the website are a resource for those that do. I recommend getting tested for deficiencies to determine your need for a supplement as instructed in the book and blog. I also don’t recommend starting multiple supplements all at once. I recommend starting one at a time and then adding another a week or so later once it has been confirmed that the first supplement is not causing any harm. Christine- Did you know that reactive foods trigger an inflammatory response in the GI tract, leading to malabsorption of nutrients (gluten sensitivity in particular has been implicated in causing a Selenium deficiency, a well known risk factor for Hashimoto’s), and can also produce intestinal permeability whenever they are eaten? I went through an entire bottle of selenomethionine and was finally feeling great. After the fourth day I woke up pain free and had enough energy to go for a walk ( I was practically bed ridden at this point). I couldn’t believe how something so simple finally helped. I took a break after the first bottle and continued to feel fantastic. But after the holidays I had another flare up so decided to try again except every time I do I get these extreme dizzy spells that can last for days. It seems to stop after a few days of not taking it. Should I be worried? Is this something that will clear up if I continue or should I stop completely? PS I am following a gluten and dairy free diet and am on NDT. My last Free t3 and Free t4 test were in normal range. Tammy – thank you for following this page. Do you have Hashimoto’s or a thyroid condition? I do have a full supplements chapter in my book. Have you checked it out? Not everyone should be taking every supplement, and the book will help uncover your root cause. This will help you figure out your supplementation. I can’t thank you enough for your article and your book, The Root Cause. Just recently, I learned that I should have been taken my vitamins four hours after taking my Synthroid medicine. My question is when can probiotics and Betaine with Pepsin be taken? Should it be immediate taking Synthroid medication? Do you have a time schedule of when vitamins and minerals should be taken? I have read conflicting stories. Please advise. I find I get gastritis when I take HCL. Is there any way around this? Jean- Not everyone will need every single supplement! In fact, I believe that most nutrients should come from the diet, this is why I always list food sources for most of the nutrients, vitamins, minerals and probiotics that are depleted in Hashimoto’s in the book and on the blog. However, some may require/prefer supplements and the supplements on the website are a resource for those that do. I recommend getting tested for deficiencies to determine your need for a supplement as instructed in the book and blog. I also don’t recommend starting multiple supplements all at once. I recommend starting one at a time and then adding another a week or so later once it has been confirmed that the first supplement is not causing any harm. Jill- There are quite a few options for thyroid medications. In my experience, what works for one person may not work for another. If your doctor will not prescribe the medication you are looking for, ask your local pharmacist for doctors in your area who prescribe the medication you are looking to try. Have you read these articles? How does the Nutrience multivitamin that you also recommend fit into this? For example, if I’m taking Nutrience then I wouldn’t take additional selenium since it’s already in the multi. Are there other considerations for including Nutrience in this supplement protocol? Thanks! Nicole- Not everyone will need every single supplement! In fact, I believe that most nutrients should come from the diet, this is why I always list food sources for most of the nutrients, vitamins, minerals and probiotics that are depleted in Hashimoto’s in the book and on the blog. However, some may require/prefer supplements and the supplements on the website are a resource for those that do. I recommend getting tested for deficiencies to determine your need for a supplement as instructed in the book and blog. I also don’t recommend starting multiple supplements all at once. I recommend starting one at a time and then adding another a week or so later once it has been confirmed that the first supplement is not causing any harm. Thank you so much, dear Dr. Wentz, the documentary was fantastic! Question about echinacea. Dr. Kharazzian said in his book, that echinacea would stimulate the Th1 response, which is not good, if you are Th1 dominant. However not every Hashimoto-patient is Th1 dominant. So would it be OK to take echinacea, since I have many symptoms which suggest, that I am Th2 dominant? Joanna- Some natural substances have been shown to shift our immune system to produce more Th-1 cells, such as beta-glucan mushrooms, Echinacea, and licorice root. These products are sometimes advertised as “immune boosters” or “immune stimulants.” Also just to add, Chlorella and spirulina are sometimes recommended as detox supplements, but they may have some immune stimulating properties that can induce or exacerbate autoimmune conditions, through the upregulation of TNF-A (the Th-1 branch). This same reaction has also been reported with echinacea. There have been a few cases of new onset autoimmune conditions following the use of these supplements!Not everyone will need every single supplement! In fact, I believe that most nutrients should come from the diet, this is why I always list food sources for most of the nutrients, vitamins, minerals and probiotics that are depleted in Hashimoto’s in the book and on the blog. However, some may require/prefer supplements and the supplements on the website are a resource for those that do. I recommend getting tested for deficiencies to determine your need for a supplement as instructed in the book and blog. I also don’t recommend starting multiple supplements all at once. I recommend starting one at a time and then adding another a week or so later once it has been confirmed that the first supplement is not causing any harm. Are there alternatives for the enzymes and pepsin that are not pig derived? Thank you. Tricia- Not everyone will need every single supplement! In fact, I believe that most nutrients should come from the diet, this is why I always list food sources for most of the nutrients, vitamins, minerals and probiotics that are depleted in Hashimoto’s in the book and on the blog. However, some may require/prefer supplements and the supplements on the website are a resource for those that do. I recommend getting tested for deficiencies to determine your need for a supplement as instructed in the book and blog. I also don’t recommend starting multiple supplements all at once. I recommend starting one at a time and then adding another a week or so later once it has been confirmed that the first supplement is not causing any harm. Ive had Hashis hypo for 15+ yrs. Last yr i went through early menopause or ovarian failure. Since then my usually stabile hypo has gone haywire and i feel like im dying. Im 42 yrs old with 3 kids under 8 and can barely function. Im on levo as that as all that is available in my country. I asked my endo re diet and gluten and she disagreed with me taking gluten out of my diet. My body seems to be resistant to levo as my TSH is 13 eventhough im on 100mgs of eltroxin. We dont have any supplements similar to what you listed and no compoyndong pharmacies here. What can i do?? I need my life back. I dev awful anxiety due to being so ill and am on antidepressants but they arent really helping as im extremely med sensitive so cant tolerate a hogh dosage. Please help with any suggestions at all!! Louise- Going gluten free is always the first step that I recommend. I’ve found through my page that a good percentage feel better off of gluten. About 20% will actually go into remission by doing so. Some researchers have found that three to six months on a gluten-free diet can eliminate organ-specific antibodies. Hi Dr. Wentz. I am still so slow. So I am going to try and add some vitamins to the mix. I am one who flip flops from high to low. But mostly low. So I’m more Hypo than Hyper. Oddly my thyroid journey started then I was 15 years old and I am 52!! When I was 15 the doctors wanted to do the radiation with iodine to kill my thyroid. My parents and myself all said no way. At the time they put me on heart medication and I took them for a year. Since then I’ve been a zombie. Well I’m sure you can imagine. So could you tell me some supplements that could help with the fatigue? I’ve had roux-en-y gastric bypass and I wonder if betaine is something I should take. I’m concerned it may be harmful since I digest differently than most. I don’t have a doctor I can ask because there aren’t any around here who treat Hashimoto’s as anything but lab numbers. Does anyone else have this concern? Louise- Not everyone will need every single supplement! In fact, I believe that most nutrients should come from the diet, this is why I always list food sources for most of the nutrients, vitamins, minerals and probiotics that are depleted in Hashimoto’s in the book and on the blog. However, some may require/prefer supplements and the supplements on the website are a resource for those that do. I recommend getting tested for deficiencies to determine your need for a supplement as instructed in the book and blog. I also don’t recommend starting multiple supplements all at once. I recommend starting one at a time and then adding another a week or so later once it has been confirmed that the first supplement is not causing any harm. Heather – please, understand that due to liability issues, I am unable to answer specific medical questions. I was diagnosed with hashimotos about 8 years ago and am currently not on any thyroid meds since going gluten/ dairy free. However since November I feel like a switch has been flipped and I can’t shut it off. My anxiety is through the roof and I have started having panic attacks.My mind is racing constantly,I no longer digest food easily and have many other weird symptoms. I just don’t feel like myself. It is so frustrating and I just want my life back! Praying your book helps lead me to the answers I need to figure out this complicated puzzle! Molly- Thank you so much for your support. I’m looking forward to hearing your progress on this page. Make sure to take the book slow, take notes, highlight, and establish a baseline when making changes. Anxiety symptoms are very common in people with thyroid disorders. my husband has a large nodule on his thyroid and the surgeon wants to remove his thyroid or a partial. I say that is not necessary but most surgeons won’t remove just the nodule. What do you recommend, it has gotten to the point where he cannot swallow. Nadia- Nodules and goiters are often the result of toxicity and/or the autoimmune process. So, doing interventions to reduce the autoimmune attack on the thyroid, and toxicity, can be helpful to reduce them. Have you read my books? Thank you for all your research and work ! Will one or the other slow down or even stop the thyroid regeneration ? In France and Switzerland there is a dilution of thyroid gland (homeopathic). It seems to wake up the thyroid who is not able to bring enough hormones. Do you think it’s a good idea to use this product ? Also i have found a pharmacy in Germany who makes NDT but they told me that the new material they received from usa is made with different animals thyroid (beef, pork, etc.) What do you think ? Marie- There are quite a few options for thyroid medications. In my experience, what works for one person may not work for another. If your doctor will not prescribe the medication you are looking for, ask your local pharmacist for doctors in your area who prescribe the medication you are looking to try. Have you read these articles? ML- I’m very hesitant in recommending iodine in Hashimoto’s. Although iodine serves as fuel for our thyroid and is very important in iodine deficiency hypothyroidism, Hashimoto’s is a different mechanism. It’s like pouring gas into an engine that’s on fire… that’s essentially what’s happening in Hashi’s, thyroid inflammation, and adding iodine to the mix before putting out the fire and fixing the engine may result in further damage to the thyroid. In those with a predisposition to autoimmunity, this has been documented time and time again, animal and human studies. I have spent 4 years researching this and have seen too many people suffering the consequences of adding iodine too soon. My approach is, let’s fix the engine first (usually a gut issue), and then add the fuel once we know that the engine is no longer on fire. Hope that you will check out my book. I have an entirechapter on the iodine controversy that references numerous studies as well as the work of Abraham and Brownstein. What is your take on Ashwagandha? I’ve seen it suggested by other functional medical doctors online and thru their blogs. Barbara – I highly recommend that you work with a functional medicine clinician. It’s an entire medical specialty dedicated to finding and treating underlying causes and prevention of serious chronic disease rather than disease symptoms. Hello. I have Hashimoto’s and Lichen Planus. I have been taking Selenium for about half a year now after reading that Selenium would be helpful for my Hashimoto’s condition but I have recently read that Selenium stimulates T cell activity, and over reactive T cell has been implicated to Lichen Planus. In my case, should I continue to take Selenium? My morning temperature is now 96.8 it has slowly fallen over the years. Five years ago it was 97.3. I had autoimmune problems with my kidneys, but did not realize it could also affect my thyroid. Sam – thank you for following this page. Do you have Hashimoto’s or a thyroid condition? I have had my thyroid removed, goiter. I had a problem since the 80s. When it was removed they got worse. I have asked a lot of Doctors and even experts on line how can I feel alive again or just better. I have never got an answer that helps. I am 80#over what I should be. At 62 I see a heart attack some day. Something I’d rather not do. I am tired of feeling 95. I should be enjoying what life I have left. Any help would be appreciated. Most thyroid conditions result from the immune system attacking the thyroid because the immune system is out of balance. Even when the thyroid is taken out surgically, is ‘dead’, or treated with radioactive iodine the autoimmunity still persists in most cases. Many people will have their thyroids removed, and will develop new autoimmune disorders such as Lupus, Rheumatoid arthritis, etc. The immune system just finds a different target. We need to re-balance the immune system to prevent this (sometimes the autoimmunity can be reversed as well). The gut determines your immune system. With the exception of discussing proper thyroid medication dosing, the majority of my website and my book focuses on balancing the immune system. The info I present is based on my own research and journey for overcoming my autoimmune thyroid condition. I have to say first , your an inspiration to all of us struggling to understand all of our symptoms , I’ve been trying , fighting my way out for at least 7 years without any help from my endo , I’ve been trying to free myself of the synthetic synthroïd that I’ve been taking now for 17 years, as my life is stagnating in advancement but getting worst and still living in no quality of life , I won’t list my depressing symptoms , everyone knows them , recently I’ve tried to take my health back and tried a thyro-support supplement and only made my situation worst I was on .75 now I’m taking .88 , doing it on my own without knowledge just desperation was not an good idea, I asked my endo to try the natural Armour , and she turned red and said ” don’t ask me for any natural remedies ever “!they don’t work and you need synthroïd because there is no way to heal from your illness and if I was you I would be more worried if I got off synthroïd you could get in a coma , she has been giving me a TSH test once a year for many years now and I’ve been living with all my symptoms since ! Since I’m not a Dr or anywhere in the medical field , I felt despair , then I started to find more are more info about this mess of my situation on the internet but everything became confusing until I found you , thank you for being clear an so honest ! Now I’m researching first for a new doctor , I wanted to know one thing about the products listed above in this article , like the probiotics etc… can I try these products even if I’m taking Synthroïd ? Also since I live in Canada , where we can not have a choice or say in what kind of medical care we want , do you know of a doctor in Quebec , Canada that I can be referred to ! I need the right kind of help to heal too , I’ve been also following your amazing episodes on the Thyroid Secret and it’s given me so much hope , but feeling helpless about my situation since I havent found anyone willing to follow up this closely for me . Do you have any suggestions for me ? Thank you so much for all of your honesty about this whole mess ! Hi Dr. Wentz! I was looking into purchasing some of the Pure Encapsulation products that you’ve mentioned but some, like the Probiotic 50B for example, contain Rice Starch. I have been completely grain free and following your protocols for seven months and have seen my TPOs drop by more than 1,000! Therefore, I worry about starting these recommened supplements because they contain Rice Starch. Are these supplements supposed to be ok for those of us that are grain free? Ivy – thank you for following this page. Pure Encapsulations supplements are generally very hypoallergenic I’ve found them to be very helpful for those with Hashimoto’s. However, it’s always helpful to consider your needs and sensitivities when selecting supplements. please help me to understand my blood work test. Do I have Hashimoto’s. I have been extremely tired, dizzy, and have brain fog. I have back and neck pain. I am only 32 years old. I have no insurance. After thinking about my symptoms I asked to test my thyroid hormones. Now the test results came back and I am very scared and I don’t even know where to start. I understand from your book, it is important to top eating dairy and gluten. What else can I do? Do I need to get on thyroid medication. Please help me. Nataliya – please, understand that due to liability issues, I am unable to answer specific medical questions. Nini – I’m very hesitant in recommending supplements that contain iodine in Hashimoto’s. Although iodine serves as fuel for our thyroid and is very important in iodine deficiency hypothyroidism, Hashimoto’s is a different mechanism. It’s like pouring gas into an engine that’s on fire, adding iodine to the mix before putting out the fire and fixing the engine may result in further damage to the thyroid. In those with a predisposition to autoimmunity, this has been documented time and time again, animal and human studies. Not everyone will need every single supplement! In fact, I believe that most nutrients should come from the diet. This is why I always list food sources in the book and on the blog, for most of the nutrients, vitamins, minerals and probiotics that are depleted in Hashimoto’s. However, some may require/prefer supplements and the supplements on the website are a resource for those that do. I recommend getting tested for deficiencies to determine your need for a supplement as instructed in the book and blog. I also don’t recommend starting multiple supplements all at once. I recommend starting one at a time, and then adding another a week or so later once it has been confirmed that the first supplement is not causing any harm. I don’t see anything about how much iodine is too much, just that one should not take too much, but how much is”too much”? My multivitamin has 100 mcg in it. But it has a lot of other good supplements in it. Should I switch to one with fewer vitamins/minerals in it? Annette – thank you for following this page. I’m very hesitant in recommending iodine in Hashimoto’s. Although iodine serves as fuel for our thyroid and is very important in iodine deficiency hypothyroidism, Hashimoto’s is a different mechanism. It’s like pouring gas into an engine that’s on fire… that’s essentially what’s happening in Hashi’s, thyroid inflammation and adding iodine to the mix before putting out the fire and fixing the engine may result in further damage to the thyroid. In those with a predisposition to autoimmunity, this has been documented time and time again, in both animal and human studies. I have spent 4 years researching this and have seen too many people suffering the consequences of adding iodine too soon. My approach is, let’s fix the engine first (usually a gut issue), and then add the fuel once we know that the engine is no longer on fire. Hope that you will check out my book. I have an entire chapter on the iodine controversy that references numerous studies as well as the work of Abraham and Brownstein. Hello Dr. Wentz! I start the Gut Protocol tomorrow:) so far I’ve been feeling great! Truly life changing! I have a question about taking too many supplements. I just finished organizing Gut protocol supplements and assigned times to take them and it looks crazy! I’m including all supplements in the protocol plus added a few things my labs showed I’m deficient (Vit.D, Vit B12,Iron) as well as selenium, Vit. E and benfomax for maintenance. Based on best hours to take for absorption (empty stomach, morning with meals, after meals, between meals, divided dosages) I will be taking supplements at 6am, 8am, 10am, 11am, 12pm, 1pm, 3pm, 4pm,5pm, 7pm,8pm ? I’m not scared of the hard work but wanted to check if this is the way usually the last protocol looks like 🙂 all supplements included are as per listed on the book plus a few months mentioned I was defficient and for maintenance. Nothing new or outside that is mentioned in the book. Im anxiously waiting for your response! Looking forward to starting the last phase! Anahi – thank you for following this page. For questions pertaining to the protocols please contact my team at info@thyroidpharmacist.com and they will be happy to help you. Thank you for this wealth of information on Hadhimotos, I would like to find out the best supplements for hypothyroidism please. Joelle – thank you for following this page. Not everyone will need every single supplement! In fact, I believe that most nutrients should come from the diet. This is why I always list food sources in the book and on the blog, for most of the nutrients, vitamins, minerals and probiotics that are depleted in Hashimoto’s. However, some may require/prefer supplements and the supplements on the website are a resource for those that do. I recommend getting tested for deficiencies to determine your need for a supplement as instructed in the book and blog. I also don’t recommend starting multiple supplements all at once. I recommend starting one at a time, and then adding another a week or so later once it has been confirmed that the first supplement is not causing any harm. I read in one of your articles about a supplement that can help with shortness of breath. I now cannot find the article or the name of the supplement. I have been reading and following your Hashimoto’s protocol for a month and a half now and have seen a significant reduction in symptoms. Thank you!!! Jamie – thank you for following this page. Not everyone will need every single supplement! In fact, I believe that most nutrients should come from the diet. This is why I always list food sources in the book and on the blog, for most of the nutrients, vitamins, minerals and probiotics that are depleted in Hashimoto’s. However, some may require/prefer supplements and the supplements on the website are a resource for those that do. I recommend getting tested for deficiencies to determine your need for a supplement as instructed in my book and blog. I also don’t recommend starting multiple supplements all at once. I recommend starting one at a time, and then adding another a week or so later once it has been confirmed that the first supplement is not causing any harm. Here is an article you might find helpful. Hey Dr. Wentz. I understand that the adrenals play a huge role in thyroid health. Im a 22 year old who ran into a serious adrenal fatigue and have been fighting it very hard for months. My naturopath and chiropractor are working with me and have me on a grass fed New Zealand glandular. Now that it has been a good deal of time I believe I am now in the hyper adrenal side and high cortisol as I have tons of energy actually too much . This glandulars strong I’ve also experienced a bit of extra water retention. My question that I hope you can answer is how do I get my adrenals to start producing dhea progesterone and all the hormones again without getting an excess of the cortisol adrenaline and all the stuff I don’t need. My diet is organic only and grass fed higher fat and protein with some good carbohydrates. When I take ashwagandha I notice the cold feet symptom goes away and if I do nothing and take that glandular the cold feet will be there . Please help! Low stomach acid which has given me acne that gets better with the betaine HCL but doesn’t all go away, and adrenals that are not balanced. I’m actually concerned now if when I get off the glandular my adrenals will be lazy or weak and put me back to square one! Organs healing organs has been a practice for years by many different cultures like eating a liver for your liver so it can’t be that bad I’m just so lost in how to repair the adrenals while also not having cortisol go too high and constantly be in a fight or flight mode! Please help Dr. Wentz! Thank you so much ! Erik – thank you for following this page. When people have adrenal struggles, we often see that their release of cortisol is altered. People with healthy adrenal function release the most cortisol in the morning. People with impaired adrenal function may wait to release their cortisol at the end of the day. Taking an adrenal adaptogen like the Rootcology Adrenal Support or the Pure Encapsulations Daily Stress Formula in the mornings can help. Additionally, I recommend going to bed before you experience that energy rush. If it comes around 10pm, going to bed around 9pm would greatly help your adrenals. Having Hashimoto’s can feel very stressful. Having out of range thyroid hormones, adrenal fatigue, negative food sensitivities and low nutrient levels can lead to feelings of anxiety, hopelessness and stress. Treating these issues one at a time is the best plan of action. You can recover and regain your health! My new book Hashimoto’s Protocol is a step by step guide to the interventions that helped 80% of the people 80% of the time. I hope you check it out. Dr.Wentz thank you so much you are such an Inspiration and so helpful. My adrenal fatigue has been going on for a while but now that I’ve been on the grass fed glandular I feel that I have been actually in the high cortisol range and more hyper. My only concern is if I stop the glandular will my adrenals crash or what should I do. The coldness in the extremities goes away with ashwagandha that is really what makes me feel I’m actually in more of a hyper state. Adrenal tissue supplementation seems great but I am sure it provides me with a lot of the hormones such as cortisol and adrenaline epinephrine etc I just don’t know how much. So confusing !! But thanks again for a response it means the world to me god bless you! Interestingly, at first my antibodies were slightly elevated but I got out of that through all organic only as a new lifestyle change and nutrient dense foods. My main concerns are the low stomach acid (acne as a result) and getting out of this sympathetic dominance cold extremities stage. Is it harmful to continue the grassfed adrenal tissue my naturopath provided? Erik – Here are a couple articles you might find helpful. Erik – you are very welcome! I understand how frustrating and confusing this is. Having Hashimoto’s can feel very stressful. Having out of range thyroid hormones, adrenal fatigue, negative food sensitivities and low nutrient levels can lead to feelings of anxiety, hopelessness and stress. Treating these issues one at a time is the best plan of action. You can recover and regain your health! My new book Hashimoto’s Protocol is a step by step guide to the interventions that helped 80% of the people 80% of the time. I hope you check it out. I like Nature’s Plus- Source of life multiple. I forgot to all vitamin B complex to the list. Laura – thank you for reaching out. As a Pharmacist I am very picky about what brands I recommend to my family, clients and friends. Pure Encapsulations is a pharmaceutical grade brand that has extremely tight quality control and manufacturing guidelines. Each product undergoes rigorous testing by a third party laboratory to verify label claims, potency and purity. All the products sold by Pure Encapsulations are free of gluten, dairy, and additives that may impair absorption. These supplements are normally only available through healthcare professionals, however the company has agreed to allow Dr. Wentz to set up a store on their website for the supplements she has found helpful for Hashimoto’s. I use the Now brand for Vit D3 5000IU and eat fruit for Vit C. Time release Vit C from Now brand is ok. Coenzymated B vitamins absorb/help better. Try different brand to find which one helps you the most. Best wishes. I was diagnosed with stage 3 triple negative breast cancer almost 8 years ago. After chemo, surgery, and radiation I’ve never been the same. 1 year after my last chemo I was still exhausted and noticed my hair wasn’t coming back in like it should. It will get to about 5-6 inches but is so wispy and fine, and I have about 1/4-1/3 of what I had prior to chemo. I did not have the type of chemo that causes permanent hair loss. After lots of texts I have Hashimoto’s, critically deficient in Biotin, borderline deficient in Vit E, low B5, low ferritin (can’t keep it up despite supplementation and eating iron rich foods), and low Vit D. I just began a 100B probiotic and digestive enzymes and am having the sensitivity tests you recommend. I need to and will get to the root cause/s of this hair issue. My question is, is this a lost cause? Once I finally figure out what is triggering my Hashimoto’s and adhere to a strict diet + supplementation, should I expect my hair to come back? I’m so desperate. Thank you. Terri – thank you for sharing your journey. My heart goes out to you. Hair loss is a distressing symptom experienced by women with Hashimoto’s. For women, our hair represents our femininity, and losing our hair is a constant reminder that something is off and that we are not well. Can you recommend where to start with these supplements if currently pregnant? Lauren – thank you for reaching out. I wish I could give you more direct advice but, each person will react differently. I would advise you to ask your trusted clinician who’s care you are under. I am not able to respond directly to these types of questions here. Here are a couple articles you may find interesting as well. I have been on LDN for about 5 years….it was a wonder drug reducing my antibodies from 600 down to 5 in about 6 months!! I am always on an AIP diet….but now the LDN has worn out it effectiveness and my antibodies are back up to around 200. My Functional and Hormone Doc says LDN does not work long term in her experience…..have you found this also?? LDN helps block hidden gluten, but trying to eating 100% gluten free is needed since a person may become more sensitive to gluten and then smaller amounts may hurt. LDN is a miracle for me. If I don’t take it I sneeze loudly and feel very sick. LDN is saving my life. I have had LDN for 17 years and it still helps me. It is awesome help! It helps my immune system work right. LDN doesn’t block GMO which can hurt the gut lining…just gluten which is wheat/barley/rye..oats/corn/rice. Taking LDN and not eating gluten free may not help as much since LDN is a low dose and a person can override the medicine with what they eat. Zn/Se/enough iron/probiotic may help convert T4 to T3. No gluten/LDN to help block hidden gluten/no GMO/no soy/no dairy/low sugar/no food with a label (may have hidden gluten/GMO etc). Mn/Mg/Vit B12 with intrinsic factor/Vit A 10,000IU and more may help the thyroid. Iodine with Se may help. Iodine alone may not help and may hurt. Hair test shows iodine and other mineral levels and heavy metals. Detoxing mercury/silver etc may help the thyroid work better. Sweating may help detox. Sea salt has ~22 minerals and Himayalan salt has ~ 88 minerals which may help restore minerals after detoxing. Progesterone may help the thyroid/adrenals. Herbs may help like Vitex. MACA may help, but it cruciferous family so cooked/gelatinize MACA may not block thyroid. MACA was great help for me. It let my brain work. MACA maybe 30% iodine and have many nutrients. I’ve followed your work for more than two years, and have found so much helpful information; particularly the addition of selenium and vitamin E have contributed to massive improvement in my vitality. Have you ever calculated the monthly or daily cost of the supplements you recommend, or researched food sourcing of the recommended supplements? I tend to get pill esophagitis, and have a family history of esophageal cancer so I prefer to eat my recommended nutrients. I’m also a bit staggered by the cost of supplementing, as a retired person. Nancy – thank you for reaching out. Not everyone will need every single supplement! In fact, I believe that most nutrients should come from the diet, this is why I always list food sources for most of the nutrients, vitamins, minerals and probiotics that are depleted in Hashimoto’s in the book and on the blog. However, some may require/prefer supplements, and the supplements on the website are a resource for those that do. I recommend getting tested for deficiencies to determine your need for a supplement as instructed in the book and blog. I also don’t recommend starting multiple supplements all at once. I recommend starting one at a time and then adding another a week or so later once it has been confirmed that the first supplement is not causing any harm. This is great info! I recently ordered the Pure Encapsulations Daily Stress Formula you recommended. Is it okay for me to start on daily doses of the Moducare at the same time? When I was diagnosed with Hashimotos, I was also diagnosed as osteopenic. I began taking calcium with d3, but started taking only d3 as I progressed through the hashimotos protocol. Is it more beneficial to take calcium with d3 for symptoms of osteopenia or could 5000 mg of d3 suffice? Elaine – thank you for reaching out. I wish I could give you more direct advice but, each person will react differently. I would advise you to ask your trusted clinician who’s care you are under. I am not able to respond directly to these types of questions here. Here is an article you might find helpful. I have tried many different supplements and in different combinations, from what my doctor suggested and I have used your chapter on supplements as a reference. I’m currently taking some of the supplements listed above, but to be perfectly honest I don’t think they have any effect on me, positive or negative. I recently got tired of popping so many pills and I just stopped everything for a couple of months and there was no difference whatsoever. And when I started taking supplements again, gradually, I again noticed no difference, aside from light stomach cramps. I wonder if for some supplements really don’t do much. Are supplements supposed to improve the condition of all Hashimotos patients or does it vary from person to person? Im not yet taking medication as my hormone levels are mostly ok, but my symptoms keep getting worse as I age. I guess I’m just tired of taking on major diet and lifestyle changes and seeing no results . I’d love to hear your thoughts on this. And thank you for your well researched and concise articles! Hi Izabella it would be so much easier if any is these supplements could be combined from a compounding pharmacy. Would you suggest any that could be turned into 1 magic pill? Kath – thank you fro reaching out. As a pharmacist I am not a big fan of combination products, and prefer to start supplements one at a time, as there is a potential of reacting to some of the ingredients. Not everyone will need every single supplement! In fact, I believe that most nutrients should come from the diet, this is why I always list food sources for most of the nutrients, vitamins, minerals and probiotics that are depleted in Hashimoto’s in the book and on the blog. However, some may require/prefer supplements, and the supplements on the website are a resource for those that do. I recommend getting tested for deficiencies to determine your need for a supplement as instructed in the book and blog. I also don’t recommend starting multiple supplements all at once. I recommend starting one at a time and then adding another a week or so later once it has been confirmed that the first supplement is not causing any harm. Unfortunately Douglas labs has discontinued Wobenzym® PS. What do you suggest? 1. When you say to have Betaine with Peptide after consuming protein, do you mean specifically meat protein i.e. seafood, poultry etc or does that extend even to grains and vegetables? 2. You recommend Selenium for antibodies – I haven’t had much luck with NAC since it raises glutathione. I got some vivid dream and fatigue with NAC. Since selenium increase glutathione, do you know if it may have a similar effect? I’m so excited that your Hashi is in remission and you are a new mom – congratulations! It’s so hopeful to me as I hope to be on the same path soon. Thank you for all your help and time! Anusha – thank you so much for reaching out! I appreciate your kind words and support! <3 For questions pertaining to the supplements please contact my team at info@thyroidpharmacist.com and they will be happy to help you. First of all, I’m so thankful for both of your books! I have recently been diagnosed with hyperprolactinemia and I also have Hashimoto’s. I was wondering if it’s safe to take Vitex while on levothyroxine and if I can take them both at the same time in the morning? Alina – thank you for reaching out. <3 I am not able to advise on whether this supplement would be appropriate for you and your specific health needs without a comprehensive health assessment. Please discuss the use of supplements with your personal doctor or pharmacist.